The iMac's processing power has been upgraded with an 8th-gen 3.6 GHz Intel Core i3 Quad-Core processor as well as 8GB of DDR4 RAM. Graphics are powered by a dedicated AMD Radeon Pro 555X graphics card, and for storage, there it's equipped with a 1TB 5400 rpm HDD. 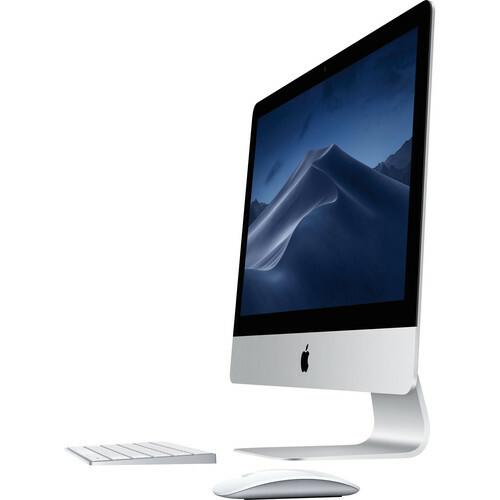 This iMac is equipped with an 8th-gen 3.6 GHz Intel Core i3 Quad-Core processor and an AMD Radeon Pro 8 graphics card. Storage moves along quickly too, with a 1TB 5400 rpm HDD, so no matter what you're into, you can get it done on your Mac. Box Dimensions (LxWxH) 26.5 x 21.5 x 9.0"
21.5" iMac with Retina 4K Display (Early 2019) is rated 3.0 out of 5 by 1. Rated 3 out of 5 by Basya from Good Enough Purchase and shipment from B&H perfect as usual, but I am underwhelmed by the new iMac. The retina screen is sharp and beautiful, but speed disappoints on even simple tasks. I shouldn’t be seeing the beach ball on a new iMac with almost nothing loaded onto it. We feared Apple would go downhill when Steve Jobs died and I think we have to admit that it has. Sad to say, this is not top drawer. Its ok.
CAN THE SLOW 5400 RPM HARD DRIVE ON THIS MODEL BE UP GRADED TO A FUSION OR SSD DRIVE? I HAVE READ THAT IMAC 21.5 INCH MODELS HAVE TO HAVE A CONNECTOR TO SWAP IN A SSD DRIVE. PLEASE CLARIFY?